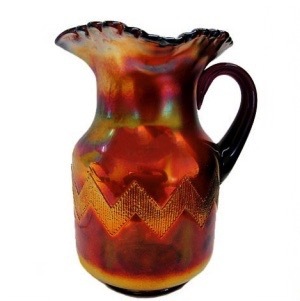 Pattern Description: A wide banded zig zag circles the body of the pitcher. This blank was used for the enameled Columbine or Shasta Daisy patterns. The wide banded zig zag circles the body of the pitcher. Fenton used this blank for their floral enameled patterns like Columbine or Shasta Daisy, but apparently a few made it out of the factory without the painting.